These giant geometric puzzles are tantalizing brain teasers rendered in precisely cut wood. It is a great gift for anyone. adult or teenager. Conversation starter if displayed. High-quality workmanship. Perfect size - large enough to handle without being cumbersome. 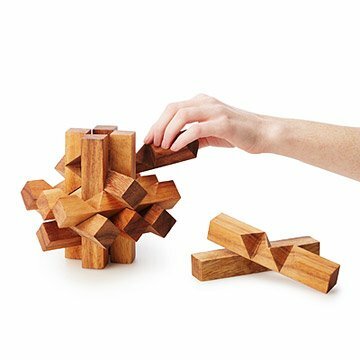 I would highly recommend this quality wooden brain teaser. Great table topper to add a fun & artistic adventure puzzle people will enjoy. Bought as a Father's Day present for my father in law and he loved it! It looks cool once assembled and it is fun to put together. A little challenging but worth the effort! Something fun and different to occupy time when there isn't mist else to do. Harder than it looks it does take perseverance!